Universal Weight Enterprise Company Limited (or simply UWE) was established in 1985. The UWE factory is currently located in Taiwan, where research, design, and manufacture of the products takes place. Presently, UWE offers expertise in design, manufacturing and distribution to clients worldwide. 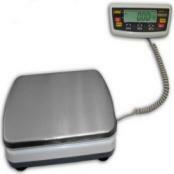 Intelligent UHR High Resolution Industrial ScaleUHR high precision laboratory quality bench scale. ISO 9001, Ultra-High Accuracy 30,000 Divisions, Strong, Non Corrosive Cast Aluminum Structure, Large 2" High Backlit Display, Accumulation, RS 232 Interface, Animal Weighing, 110VAC & Rechargeable Battery. Capacity 13 lb to 660 lb. 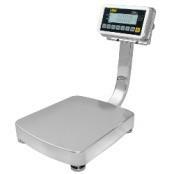 Base sizes range from 11" x 13" to 16.5" x 20.5"
UWE PS2 Series Stainless Steel ScaleUWE PS2 scale includes Heavy Duty All Stainless Steel Construction, Rechargeable Battery, Large Backlit LCD Display and Stainless Steel Load cell. Stainless steel platform, pillar, indicator, load cell and housing - easy to clean for food processing or harsh environments / wash down resistant. Reads in g, lb, lb:oz. UWE AGS Stainless Steel Counter-Top ScaleUWE AGS counter-top scales feature all stainless steel housing which is easy to clean for food processing or harsh environments. Heavy duty construction will withstand harsh industrial operation. Sealed electronics improved water and dust resistance. Compact size uses less counter space. NTEP approved. 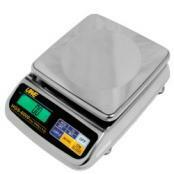 UWE UFM-L NTEP Bench ScaleUWE UFM-L NTEP bench scale, Large 2 Inch Backlit Display, Rechargeable Battery. Large 19.7 x 23.6" platform. 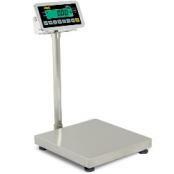 Capacities available include 120 lb, 250 lb, 600 lb, and 1200 lb. 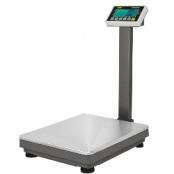 UWE UFM-B NTEP Bench ScaleUWE UFM-B NTEP bench scale 60 lb to 300 lb Capacity, large 2 Inch Backlit Display, Rechargeable Battery Configurable RS232 Interface, Large 2 inch backlit LCD display with wide viewing angle, Built-in rechargeable battery. 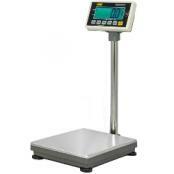 Platform: 13 x 17.7 x 3.5"
UWE Intelligent Weigh TitanN Bench ScaleUWE TitanN series legal for trade bench scale. 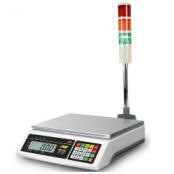 Easy to read weight indicator with large 2" display, Stainless Steel Platter and Column, Rechargeable Battery. 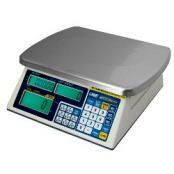 UWE SEK Series Checkweighing ScaleUWE SEK Checkweighing Scale is a dedicated checkweigher that allows you to weigh a sample against a predetermined set of parameters. Simply tell the scale what you want to be considered too light, too heavy, or just right. The scale comes with a HI-LO-GO light tower (as pictured) for easy operation. This unit is great for quality control, order fulfillment, manufacturing or production.